José Victoriano (Carmelo Carlos) González-Pérez (March 23, 1887 – May 11, 1927), better known as Juan Gris (Spanish pronunciation: ), was a Spanish painter and sculptor born in Madrid who lived and worked in France most of his life. Closely connected to the innovative artistic genre Cubism, his works are among the movement's most distinctive. Born in Madrid, Gris studied mechanical drawing at the Escuela de Artes y Manufacturas in Madrid from 1902 to 1904, during which time he contributed drawings to local periodicals. From 1904 to 1905, he studied painting with the academic artist José Moreno Carbonero. 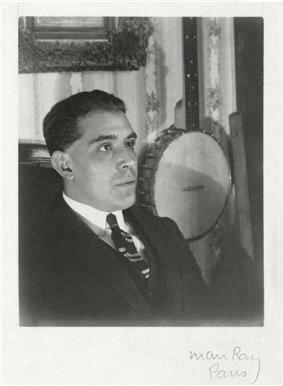 It was in 1905 that José González adopted the more distinctive name Juan Gris. In 1906 he moved to Fernand Léger. In Paris, Gris followed the lead of another friend and fellow countryman, Pablo Picasso. He submitted darkly humorous illustrations to journals such as Le Rire, L'assiette au beurre, Le Charivari, and Le Cri de Paris. Gris began to paint seriously in 1911 (when he gave up working as a satirical cartoonist), developing at this time a personal Cubist style. In A Life of Picasso, John Richardson writes that Jean Metzinger's 1911 work, Le goûter (Tea Time), persuaded Juan Gris of the importance of mathematics (numbers) in painting. 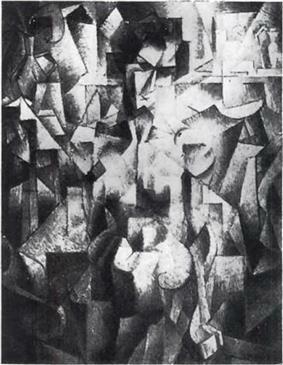 Gris started painting persistently in 1911 and exhibited for the first time at the 1912 Salon des Indépendants (a painting entitled Hommage à Pablo Picasso). 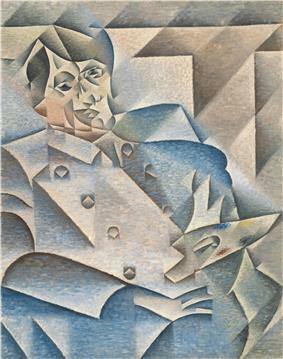 In 1912 Gris exhibited at the Galeries Dalmau in Barcelona, the gallery of Der Sturm in Berlin, the Salon de la Societe Normande de Peinture Moderne in Rouen and the Salon de la Section d'Or in Paris. Gris, in that same year, signed a contract that gave D.-H. Kahnweiler exclusive rights to his work. At first Gris painted in the style of Analytical Cubism, a term he himself later coined, but after 1913 he began his conversion to Synthetic Cubism, of which he became a steadfast interpreter, with extensive use of papier collé or, collage. Unlike Picasso and Braque, whose Cubist works were practically monochromatic, Gris painted with bright harmonious colors in daring, novel combinations in the manner of his friend Matisse. Gris exhibited with the painters of the Puteaux Group in the Salon de la Section d'Or in 1912. His preference for clarity and order influenced the Purist style of Amédée Ozenfant and Charles Edouard Jeanneret (Le Corbusier), and made Gris an important exemplar of the post-war "return to order" movement. In 1915 he was painted by his friend, Amedeo Modigliani. In 1924, he designed ballet sets and costumes for Sergei Diaghilev and the famous Ballets Russes. Gris articulated most of his aesthetic theories during 1924 and 1925. He delivered his definitive lecture, Des possibilités de la peinture, at the Sorbonne in 1924. Major Gris exhibitions took place at the Galerie Simon in Paris and the Galerie Flechtheim in Berlin in 1923 and at the Galerie Flechtheim in Düsseldorf in 1925. After October 1925, Gris was frequently ill with bouts of uremia and cardiac problems. He died of renal failure in Boulogne-sur-Seine (Paris) on May 11, 1927, at the age of 40, leaving a wife, Josette, and a son, Georges. The top auction price for a Gris work is $57.1 million (£34.8 million), achieved for his 1915 painting Nature morte à la nappe à carreaux. This surpassed previous records of $20.8 million for his 1915 still life Livre, pipe et verres and $28.6 million for the 1913 artwork Violon et guitare. Glass of Beer and Playing Cards, 1913, Columbus Museum of Art, Ohio. Violin and Checkerboard, 1913, Private collection. Nature morte à la nappe à carreaux (Still Life with Checkered Tablecloth), 1915, Private collection. Still Life with Fruit Dish and Mandolin, 1919, Private collection, Paris. Harlequin with Guitar, 1919, Galerie Louise Leiris, Paris. ^ Gris 1998, p. 124. ^ a b c , online since 2012"On "Cubism" in context"Peter Brooke, . Retrieved 19 September 2014. ^ , Solomon R. Guggenheim Foundation, Abrams, 1983"Handbook, the Peggy Guggenheim Collection"Peggy Guggenheim Collection, Lucy Flint-Gohlke, Thomas M. Messer, . Internet Archive. Retrieved 19 September 2014. ^ Oxford Art Online, "Juan Gris"
^ "Juan Gris (1887-1927) | Nature morte à la nappe à carreaux | Impressionist & Modern Art Auction | 20th Century, Paintings | Christie's". Christies.com.cn. Retrieved 2014-02-04. ^ "Juan Gris (1887-1927) | Violon et guitare | Impressionist & Modern Art Auction | 20th Century, Paintings | Christie's". Christies.com.cn. Retrieved 2012-03-23.